Enter your email address above, and we will automatically send you a link to download the Rockery Press Day Guide to Grey Wall, Little River Canyon which includes driving & hiking directions and a full day’s worth of classic rock climbs to go do. 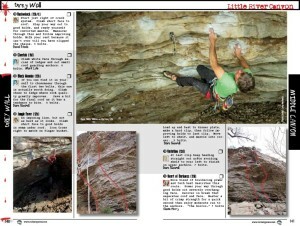 You can purchase the full Little River Canyon guide by clicking HERE. With its 5 minute approach and number of climbs from 5.11-5.13, this wall is a must visit for anyone in the area. Though there is a good range of difficulty, the mean grade at the crag is bottom end 5.12. The Grey Wall routes feature difficult climbing broken by ledges while the steeper lines tend to feature bouldery sections with sprints between good rests. The routes are generally 50-60’ long and steep. Many climbs have the climber lowering out from the wall about half or more distance away as the route is long. On winter days the sun tracks into the wall around noon, and stays full blaze for the day. In the summer the Grey Wall section can scorch, but the steeper routes generally stay shrouded by the thick canopy of hardwoods. If you need a break just follow the trail marked by painted trees to and around the lookout point then down to one of the more remote swimming holes in the canyon. Be sure to bring a pair of old shoes since there is a fair amount of water bouldering to be done. If your steep, bouldering strength is up for it, tie in and sample some of the more enjoyable steep climbing the canyon has to offer.